The United States has many legends dating from the 1800s, when the country was expanding westward and people were clearing the land for farming. This folklore includes a number of "tall tales"—humorous stories about larger-than-life characters who possessed unusual strength or cleverness and performed extraordinary feats. Some of the best-known tall tales center on a backwoods lumberjack named Paul Bunyan. Paul's Life and Adventures. Paul Bunyan, it was said, was born in Maine. His most notable feature was his immense size and the strength that accompanied it. As a baby, he destroyed acres of forest simply by rolling around in his sleep. Bunyan did everything more intensely than normal people. He slept so soundly, for example, that it once took seven hours' worth of cannon shots from the British navy to wake him. Paul Bunyan logged throughout the upper Midwest and the Pacific Northwest, and he left his mark on many parts of the continent. He created the Grand Canyon by dragging a tool on the ground and dug the St. Lawrence River. He is also said to have driven whales out of the Great Lakes by attempting to harness them for hauling logs. Another story credits Bunyan with cutting down all the trees in North Dakota and turning the region into farmland. Although Paul Bunyan was originally created to promote the logging industry and its products, at least one other industry borrowed him. Around 1920, when oil drilling was becoming common in the United States, a few tales appeared about Bunyan as an oil worker. 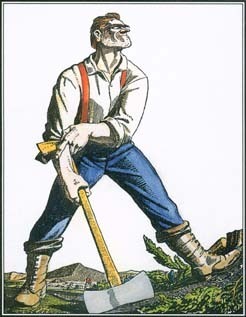 In these stories, he put his immense size and strength to use drilling for oil or constructing pipelines, tanks, and other equipment Paul Bunyan also showed great skill in using the new technology of petroleum production, often inventing new tools and techniques to bring in huge quantities of oil. A folk hero of the lumber industry, Paul Bunyan possessed many of the qualities that loggers admired. He was strong, clever, and independent. However, as his legend developed, stories focused more on his size than on his skill as a lumberjack. youths greased it by strapping hams to their feet and skating across it. Bunyan's best-known companion was Babe, his giant blue ox. Babe measured 42 ax handles wide across the forehead and was strong enough to pull the bends out of a winding road. Debatable Origins. According to people who study folktales, Paul Bunyan was not truly a folk hero who emerged from the fireside stories of lumberjacks. Rather he was a deliberate creation of journalists and advertisers seeking to promote the lumber industry. For this reason, some folklorists consider the Bunyan stories to be "fakelore" rather than true folklore. Paul Bunyan first appeared in print in a 1910 article in a Detroit newspaper. The author, James McGillivray recalled stories about the giant lumberjack that he had heard while working in logging camps. In 1914 W. B. Laughead, a former lumberjack who worked in advertising for a lumber company, used stories and cartoons about Paul Bunyan to enliven a booklet about his company's products. By 1922 the company was publishing handsome illustrated booklets about Bunyan that circulated to libraries and readers far outside the timber industry. Laughead claimed to have given Paul's blue ox the name Babe and to have invented Johnny Inkslinger and other characters. He also created the popular image of Paul Bunyan, complete with hat and whiskers. By the 1940s, professional writers had produced many books, mostly for children, about Paul Bunyan. As time went on, the stories focused more on Bunyan's immense size than on the cleverness and lumbering skill that earlier versions had highlighted. Paul Bunyan in American Culture. Some of those who wrote about Paul Bunyan were publicists for the lumber industry. Lumber and resort communities also gave Bunyan a boost by holding festivals in his honor, putting up statues of him and Babe, and claiming ties to the lumberjack and his exploits. So quickly did the journalistic creation known as Paul Bunyan capture the American imagination that statues of him appeared at World's Fairs in New York and California in 1939, just 25 years after the first Laughead pamphlet. The legendary lumberjack has also inspired sculpture, paintings, plays, and even an opera. The enormous, unconquerable Paul Bunyan, a hero of the nation's shrinking wild country, came to be seen as a symbol of the proud American spirit.